There a many definitions on Buddhism, ways of practicing and teaching and what makes a Buddhist a Buddhist. Eastern Buddhism knows varieties and there are more modern ways of Buddhism in the west. All varieties do have many things in common. One of those are the Three Gems. What makes a Buddhist a Buddhist is that he or she goes for refuge to the Buddha, the Dharma and the Sangha. The three principal roots of the tree, therefore, are the Buddha, the Dharma and the Sangha. But there is not any one single meaning to any of these words as said before. Each of them has many meanings to as many Buddhist. The word "Sangha" means a group or community. 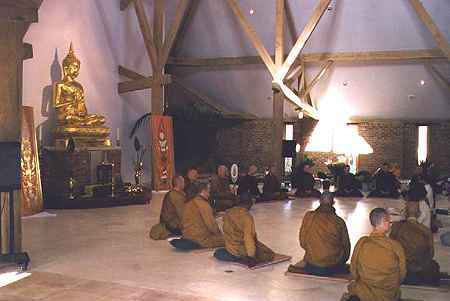 The Sangha to which a Buddhist goes for refuge is the ariya-sangha, which means the Noble Community of people who have attained insight and virtue and who have either attained or come very close to attaining Nirvana. It is important to realize that not all members of the Noble Community are monks or nuns, and that not all monks or nuns are members of the Noble Community. So a Buddhist does not go for refuge to the community of monks or nuns or even to the community of people who declare themselves to be Buddhists, but to the community of all excellent people everywhere whose insight and purity of character is significantly superior to that of the average human being. The word "Sangha" can also refer to other communities, such as the community of monks (bhikkhu-sangha), the community of nuns (bhikkhuni-sangha), the community of householders who support the monks and nuns (upasaka-sangha) and to the entire community of people who heard the Buddha and formally went to him for refuge (savaka-sangha). Sometimes some Buddhists find it convenient to think of Sangha as a a kind of concrete symbol of the much more abstract notion of the Noble Sangha of excellent people to which they go for refuge. .
Gepost door DA op 3:14 p.m. Thanks for posting this Dimitri! You know - in my tradition we have a fourth jewel - Our teacher. When we take refuge we always include him/her as well. Actually it includes all our teachers in buddhism. But then we also put a lot of importance on our teachers - more than any other line of buddhism. Wonderful blog. It is lovely place to visit.